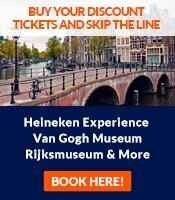 So you'd like to travel to Amsterdam? Traveling to Amsterdam is possible in many ways - planes, trains, automobiles and boats. Here are the details. We live in an age of low cost airlines and flights for less than the price of a bus ticket. Sometimes, however, trains or boats may be more convenient. So, how do flights to Amsterdam compare with other ways of entering the 'Venice of the North'? There are dozens of companies offering cheap airline tickets to Amsterdam, including the Dutch national carrier, KLM, that bastion of all things cheap and cheerful, Ryanair and the Netherlands' own low cost airline, Transavia. Amsterdam has only one huge airport (Schiphol), and the trains that stop right below the main airport terminal will bring you in the heart of the Amsterdam city center in just 20-25 minutes. For more detailed information, have a look at our pages on cheap tickets to Amsterdam or our tips on how to find cheap flights. The Netherlands is part of Continental Europe, a place where travel by train was de rigueur long before the Jet Set emerged or the Mile High Club was founded. Amsterdam's Centraal Station offers the rail-bound a great way of traveling to Amsterdam from surrounding countries. As young backpackers of all nations are no doubt aware, there are dozens of rail lines leading to Amsterdam from other parts of Europe, at a range of prices. A train ticket from Berlin to Amsterdam, for example, can cost between EUR 100 and EUR 120, which seems pricey when compared to some cheap airline tickets to Amsterdam. With train travel to Amsterdam, however, there are no extra taxes and charges like those involved in air travel, and so the cost can actually work out lower than a plane ticket in some cases. Train travel to Amsterdam definitely means a longer travel time than by air. Being on the ground, however, gives the traveler plenty of time to admire the scenery along the way, something flying to Amsterdam can't offer. The train from Berlin to Amsterdam can take between 6 and 9 hours, while Paris to Amsterdam should be between 4 and 5 hours. If you really like the romance of rail travel you may even face up to the 11 to 19 hours journey by train from Prague. Most rail companies give an expected duration of travel, sometimes accurate down to the minute, so it's always possible to consider the amount of time you will spend on the train along with the cost of the ticket. 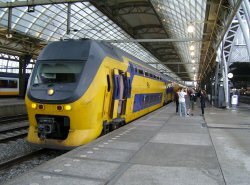 Here's more about international train travel to Amsterdam and domestic Amsterdam trains. Europe's extensive system of motorways means that driving to Amsterdam should not pose a problem. Parking once you arrive in Amsterdam can be another matter entirely, however. 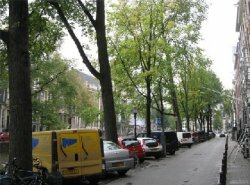 Amsterdam's canal lanes are not really suited to heavy motor traffic and parking space is both rare and expensive. One way around this is to make use of Car Hotel Amsterdam. This very handy service has arrangements with some hotels, such as the Damrak Inn at Damrak 58- 59, whereby they will meet you at the hotel on arrival, collect your car and take it away to be stored, returning it to you on the day of your departure. Eurolines, with Amsterdam offices at Rokin 10 close to Dam Square, offers bus routes between many European cities and Amsterdam for very reasonable prices. If you are prepared for the lengthy bus journey, this can be a very cost effective alternative to air travel to Amsterdam. Being a port city, Amsterdam can also be accessed via boat. 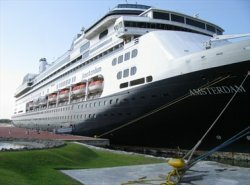 A few years ago, Amsterdam's cruise terminal right behind the Central Station was thoroughly renovated and expanded. If you're not looking to cruise, ferry passage from the British Isles is also available with Stena Line, the most prominent cross-channel ferry operator. While obviously not as flexible in terms of schedules or routes, arriving to Amsterdam on the water can suit those who have lost faith in air travel to Amsterdam, or are just looking for a more relaxed way to travel. How do flights to Amsterdam from the various continents work?